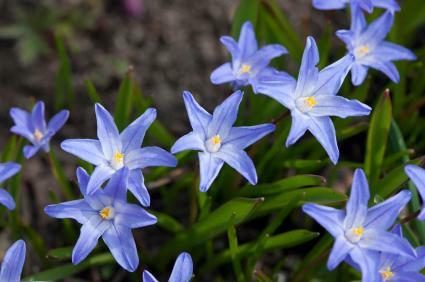 Snow Glory (Chionodoxa) - Also called Glory-of-the-Snow, these are beautiful early spring-flowering bulbs, flowering with the Snowdrop, and later, and forming a precious addition to our garden flora, growing and increasing freely in most soils. The bulbs should be planted not less than 3 inches deep. These low growing plants can grow in most soil types, in groups as close as one inch apart. While they thrive on cold weather, they also can handle very sunny conditions. Iridescent Snow Glory (Chionodoxa Gigantea) - A very handsome plant of robust habit, with broader leaves and taller spikes than in any other kind. The color of the flowers is soft violet or porcelain blue with a small white centre, coming some weeks later than the early kinds. A white form of this plant is now to be had, and a variety albo-rosea, with flowers delicately tinged with rose, but nothing can surpass in lovely and changing color the wild form. Chionodoxa Lucillae - Opening from early in February, with starry flowers an inch or more across and in many shades, from pale to deep blue, shading to a white centre. It is found in three or four well-marked forms: alba, a white kind with large flowers, found wild with the blue form, but scarce in gardens. Rosea is a scarce variety bearing pink flowers; pallida has flowers of a very light blue; and Boissieri, the best of the late flowering sorts, shows bright, deep color. Dwarf Snow Glory (Chionodoxa Nana) - A dwarf kind from Crete rarely more than 4 inches high. Its flowers are small but attractive, and carried in dense spikes of white or pale bluish lilac. Sardis Snow Glory (Chionodoxa Sardensis) - A beautiful plant with flowers of rich deep blue, free from the pale shading of other kinds, the white eye being sharply defined. It flowers during February and March according to aspect, the effect of its flowers being very good. Several varieties are grown, but the typical kind surpasses them all in beauty. Mountains of Asia Minor. late Snow Glory (Chionodoxa Tmolusi) - A dwarf variety of strong growth and latest of any in bloom. Its large flowers are of rich blue, with a large white eye faintly outlined in purplish-blue, and with a touch of deeper color on the tips of the petals. Easily grown, snow glory would look lovely planted in a bed with crocus, tulips, hyacinths, daffodils, and other spring bulbs. Consider adding this beauty to your spring flower beds.